I have a new favorite superhero. I'm not a comic-book kinda guy, but the following frame from Captain America gives me chills. It's interesting that this would come from the mouth of Captain America. 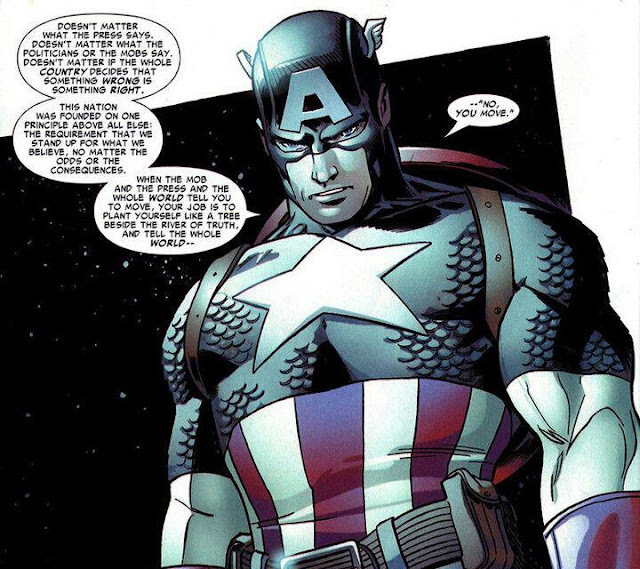 The strong association between America and truth makes this something so appropriate for this character, and that's an association that just isn't there with any other "superhero." There is also a danger implicit in Americana moralisms like this, because we see a strong devotion to principles, to ideals, but often without the foundation of Christ, the real "river of truth." We as Christians must be faithful to supply that foundation. Today we began filming on the inaugural episode of Church & State, a series of web videos providing cultural and political commentary from a distinctly Christian perspective. These videos will be the attempts of one believer to point to Christ as the foundation for life and liberty. God willing, they will provide some of the foundations for the moralisms upheld by conservatism today. While statistics are helpful and history is instructive, if that is all that we base our arguments on then we still, at the core, are humanists. It's easy to talk about how bad things are getting, but "mere talk leads only to poverty." It's easy to say "where are the Godly men?" but it's another matter to say "Here am I, LORD- send me!" Please prayerfully consider this. The God-fearing Americans that our nation needs so desperately might well be the people who are reading this right now. Edmund Burke pointed out that the only thing necessary for evil to triumph is for good men to do nothing. We need good men to stop doing nothing. We need God-fearing Americans to rise up and say "Thus says The LORD," to proclaim His Word of Truth, to tell the kings of the earth to kiss the Son, lest His anger consume them. Amen and amen. I am going to share this on our blog. We truly need to stand up and say, "Here am I, send me!" Ha, Captain America no less. I like that. Stand tall, stand firm, die fighting for what you believe. Yeah, standing around complaining about the problem doesn't do any good unless we are willing to get up off of our rear and do our best to fix it. Hello Ms. Lanita! Thanks for stopping by. I'm honored that you want to pass this on! David- amen. So... what are you going to do about it? Aha - stay tuned for a post on my blog - coming soon - What to do with an unbiblical government. I'm hoping it will cause some waves and get some good talkin going. But to answer your question fully, get the gospel out as fast as we can, and do what's right, no matter what happens. I'm starting a YouTube channel and getting more involved on Twitter, for now. Is it horribly sad that the only thing I'm going to say after this post is, "I love Captain America"? :D Captain America... do not get me started on him. He's amazing. Watch the movie if you haven't yet, I think you'd enjoy it. Bailey, thanks for checking out the channel, and I'm glad we share a mutual respect for the Captain. Jamie, I saw Captain America, and honestly wasn't crazily impressed. More on that if you want it. It was this comic that totally made him my favorite. I think I'm going to take a nap and think about it tomorrow. But seriously -- I don't feel called into politics myself and am more interested in the global church and missions than rescuing America. HOWEVER, I first want to inform myself, as an American citizen, on what is true and false about our founding, our Constitution and our form of government. (Three cheers for the awesome U.S. Constitution course at Hillsdale College!) I already have opportunities to speak at local and state gatherings, write essays and pen letters to the editor, as well as campaign. Basically, I don't want untruth to circulate in my circle of influence -- and it's not, as far as I can help it. Oh, and I want to equip and encourage the church to be strong on solid Biblical truth -- to not focus on America, per se, but to know God, His Gospel and His commission. A strong church does wonders for societal structure. "I already have opportunities to speak at local and state gatherings, write essays and pen letters to the editor, as well as campaign." Sounds like you're plenty involved! "A strong church does wonders for societal structure." Yes! The focus should never be on our country- it should be on His Kingdom. But being ambassadors for His Kingdom should have a very large affect on our country. His Word speaks to all of life- from prayer to politics- and it's well past time that the Church embraced this. Great great post Gabriel! I love that Captain America quote. Maybe we should get a Captain Australia down here. Our own super hero! BTW, I was just listening to one of the songs on your playlist, 'Because I Love You'. It's one of the most loveliest pieces of music I've ever heard! SO my question is, who is it by? I wrote all the music on that playlist. That's what I do. I'm glad you enjoyed it, by the way. Your encouragement means a lot to me. Wow! Did you really? That's AMAZING!! I visited your site, and atm I'm listening to you play Clair De Lune on your 'pianist' page. I was surprised to find out that you are a pianist, 'cause I'm one too! (A very ill-playing one though!) I have heard many versions of Clair De Lune, but yours is one of the best. Lots of the ones I have heard are dull, flat, and completely lacking in dynamics. But I love the way you put a lot of emotion into yours, and dynamics! I am of the opinion that classical music played on the piano is the world's best form of music, and believe me, I listen to A LOT of it. How long did it take you to learn that piece? Haha, that's what I say every time to people who ask me how long it took me to learn a piece of music! That comic is wonderful. I can count on my fingers how many men I know, that would say that.